I have to admit, I’ve been feeling a little blog fatigue lately. It happens every once and a while and especially of late as the theme of this blog (politics) is currently in the off-season. I’ll poke around from place to place from Blogging Tories to Nealenews and I’ll glance at topics which currently fail to motivate me to contribute. Topics such as Liberal corruption, the Governor General and the sponsorship scandal just don’t strike me at the moment and they certainly lack motivational power to get me to write in these dog days of summer. There is a truth to be learned here. If I’m turned off by blogging now, this likely represents the yearly low point in public political interest. Monte notes the nation’s general disaffection with politics. The unfortunate mood is a result of the Liberals over-spinning for the sake of power over issues. The Canadian electorate is spun-out. Look I love hockey and Don Cherry, but being a hockey fan has to come second to being a citizen. Actually being a citizen is what we are paid to do. Citizens get their pay in the form of freedom and democracy, and our obligation is to keep caring about those things even when the government makes us want to quit caring. You can of course burn off some of that disaffection by saying sarcastic things on a blog. I hear that helps. An even better thing to do though is to catch a vision. 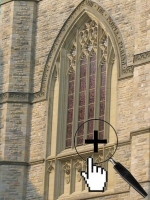 One of the arches on the Peace Tower quotes a great truism from Proverbs, (quote) Where there is no vision, the people will perish (unquote). I blog about politics because I certainly care about the state of this country. I started Blogging Tories because there are others who certainly do as well. But, I blog, first and foremost, because I want to add to the debate that is so thoroughly discouraged, the discussion that is so often met with disdain, and the dialogue that often is met with attempts to discredit. I blog because those that wish to stifle these elements of our democracy are those that rule for themselves, do so at great expense to the people, and do so without vision. This year, in June, I traveled to Ottawa to interview Monte to kickoff podcasting on Blogging Tories. After the interview was over, as I wandered around Parliament as any other tourist, I noticed an interesting quote etched into stone above a beautiful window of the peace tower at the centre of this nation’s two houses of Parliament. So, I took a picture. There is a debate brewing in this country and it is not whether or not Stephen Harper can pass as a cowboy in a small leather vest. This debate occurs between people who recognize a neglected healthcare system and wish to improve it, people that see gun violence in Toronto and are asking for a real solution to address it, and people that wish that politicians would make decisions to benefit Canadians instead of their polling numbers. We debate because we need change. We debate because those that would discourage it have lost their vision. We debate because we’re Conservatives. Thank you Monte, I think that you’ve cured my blog fatigue. Now, it’s time to cure Canadians from their Liberal-induced political coma.